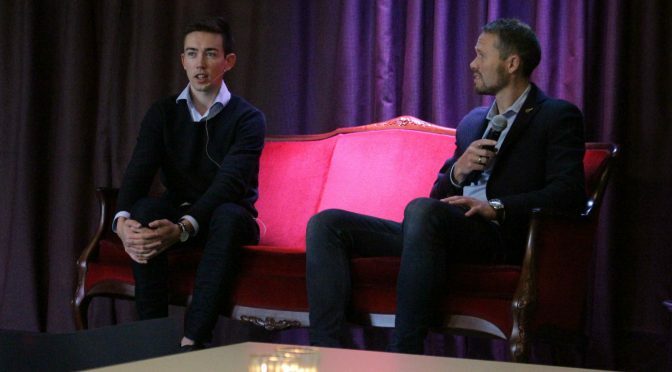 Monday, Daniel Hov, a former Sport Management student at HiMolde and now head of marketing and media at Sandefjord Fotball, talked to current students about his career and how he managed to realize his dream of working in the football industry. The story Daniel Hov started this semesters first Sport Management breakfast meeting with, was probably familiar to most of the current students. Daniel had always been dreaming about finding a job at a football club, and the bachelor studies strengthened this dream even more. Daniel then proactively started work on realizing his dream by contacting Sandefjord Fotball, a club situated South of Oslo and recently promoted to Eliteserien, Norway’s top division. Consequently, Daniel did his internship at Sandefjord Fotball and finally ended up being head of marketing and media. In this position he is responsible for making people pay attention to the club, but also for setting up actions that increase sales. However, as Daniel explained, the atmosphere at the club is highly dependent on one factor: the first team’s results. Still, it is his dream job and he enjoys working with the players and travelling with the team. Since Daniel recently supervised Anette Ree, a current Sport Management student from HiMolde, during her internship at Sandefjord Fotball, Kjell Marius Herskedal stressed the importance of creating a network of former and current students in order to find internships or regular jobs after the studies.